Beauty pure and simple. 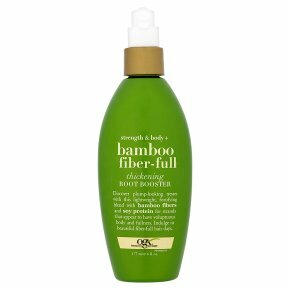 Not tested on animals.Discover plump-looking tresses with this lightweight, fortifying blend with bamboo fibers and soy protein for strands that appear to have voluptuous body and fullness. Indulge in beautiful fiber-full hair days. Why You Want It... Healthy hair is plump, full and voluptuous! This thickening blend helps to add body to your tresses from the bottom to the top giving you big, touchable, beautiful strands. What You Do... Lightly mist onto clean, damp hair, concentrating on roots. For extra volume flip head upside down and blow dry with a round brush. Do not rinse. Can also be sprayed on dry hair for touch-ups throughout the day. Warning: Avoid contact with eyes. If contact occurs rinse immediately. For best results use in conjunction with other OGX products.